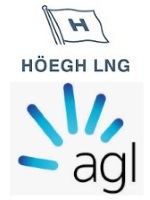 édité le 22/12/2018 - Plus de news de "Hoegh LNG" - Voir la fiche entreprise de "Hoegh LNG"
Höegh LNG Holdings Ltd. (“Höegh LNG”) today announced that it has entered into a time charter party with AGL Shipping Pty Ltd (“AGL” or the “charterer”), a wholly owned subsidiary of AGL Energy Ltd., for the provision of a floating storage and regasification unit (“FSRU”) to facilitate its proposed Gas Import Jetty project at Crib Point, Victoria, Australia that is targeting start up in 2020 – 2021 (the “project”). The charter is for a period of 10 years and remains conditional on the board of directors of AGL Energy Ltd. taking a final investment decision in relation to the project and receipt by the charterer of key environmental project approvals. The FSRU assigned to the project is expected to generate annual EBITDA of between USD 29 million and USD 31 million depending on planned technical modifications that may be specified by AGL before project start-up. Höegh LNG operates world-wide with a leading position as owner and operator of floating LNG import terminals; floating storage and regasification units (FSRUs), and is one of the most experienced operators of LNG Carriers (LNGCs). Höegh LNG's vision is to be the industry leader of floating LNG solutions. Its strategy is to develop the business through an extended service offering, with large-scale FSRUs as the main product, and focus on establishing long-term contracts with attractive risk-adjusted returns involving credible counterparts. The company is publicly listed on the Oslo stock exchange under the ticker HLNG, and owns approximately 46% of Höegh LNG Partners LP (NYSE:HMLP). Höegh LNG is a Bermuda based company with established presence in Norway, the Philippines, Singapore, the UK, USA, South Korea, Indonesia, Lithuania, Egypt, Colombia and Turkey. The company employs approximately 155 office staff and 525 seafarers. AGL sells and distributes gas and electricity in Australia. It operates the country’s largest electricity generation portfolio, it is the largest ASX-listed investor in renewable energy, and has 3.6 million customer accounts. Proudly Australian, with more than 180 years of experience, it has a responsibility to provide sustainable, secure and affordable energy for customers. Its aim is to prosper in a carbon-constrained world and build customer advocacy as the industry transforms. It has committed to exiting coal-fired generation by 2050 and the continual development of innovative solutions for its customers.